James Kloppenberg has produced an important artifact of contemporary intellectual life. Conservative academics have been essentially eliminated from college campuses. Those scholars who, whatever their political opinions, still act on the belief that intellectual integrity matters and entails unbiased investigation into an imperfectly but significantly knowable past have become a distinct, beleaguered minority. Students and faculty both increasingly demand that they and their peers be “woke,” meaning they must accept that our society is a collection of racist, sexist, and homophobic structures supported by both intentional and unknowing discrimination. In this context Mr. Kloppenberg’s latest book is on the cutting edge of elite conventional wisdom. It rewrites history in a woke mode—as a series of morality tales in which white male oppressors at best stumble toward recognition of their own sins as oppressed groups work to free themselves. There is a happy ending to the tale in the form of a society in which Social Justice Warriors push us on toward ever-greater equality and diversity. But, because the book ends around the turn of the twentieth century, we are not made privy to the means by which the world was woke, or the cost in lives during that most ideological and bloody century. It is certainly true that we have inherited the attempts of social democrats and progressives a century ago to extend the meaning of democracy from the political to the social and economic spheres. It is equally true, however, and less often acknowledged, that we have inherited the results of the unsuccessful attempts made in the nineteenth century to end regimes of economic, racial, and ethnic inequality, and the exclusion from power of women by men. Those forms of hierarchy, descended from ancient assumptions, hardened into distinct systems of white male supremacy during the eighteenth and nineteenth centuries. This is a final rejection of discourse with the “unwoke” and a demand for radical action. Kloppenberg characterizes our society as made up of “systems of white male supremacy” that must be torn down to make way for a more egalitarian society. 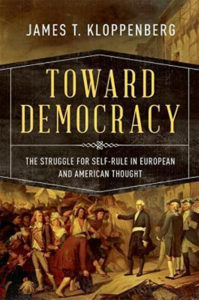 Toward Democracy culminates in discussion of the failures of post–Civil War Reconstruction and the ascent of “laissez faire.” To get there, however, it reconstructs Western history from its beginnings in ancient Greece in a manner that broadly justifies even the most radical assaults on American institutions during the twentieth century. Unfortunately, while Kloppenberg makes his ideological convictions clear from the start, his use of historical evidence is, to say the least, less straightforward. Much of his effort is taken up with reading the term “democracy” back and forth through history and across conceptual lines to make it appear far more coherent, popular, and capacious than any but the most woke modern social democrat would admit, and at the same time harnessing largely anti-democratic figures such as Aristotle to his project. Indeed, Kloppenberg’s “democracy” goes beyond social democracy, stretching the term to cover all forms of “diversity”—a term he uses in wildly differing historical contexts to render ideological even the most obvious forms of cultural conflict and to not-so-subtly impose on history a story of development toward contemporary identity politics. In rewriting history, Kloppenberg highlights the thought and actions of various obscure figures he deems heroes of oppressed groups fighting racism, sexism, and so on. He also reads out of polite company those persons, movements, and even products that are no longer acceptable in “woke” company. Andrew Jackson is cast into the outer darkness for riding “a wave of white supremacy” to the White House. Kloppenberg even takes the time to inform us that tobacco, an important crop in the American colonies, has been responsible for many deaths—though, of course, he makes no move to blame the Indians who first cultivated the crop. Numerous more serious and influential figures are treated as important only to the extent they may be useful in pursuing Kloppenberg’s goals. One example: “Although Locke himself seems not to have protested the subordination in his own day of Africans in the slave trade, Indians in the Americas, day laborers in England, or women everywhere, it should be clear that the principles on which his theory of government rested provide ammunition for those who were to challenge—from his day to ours—the unjustifiable treatment of members of those groups.” American thought during the revolutionary period also is characterized as useful “ammunition” for contemporary political purposes. Such self-serving reductionism is not Kloppenberg’s only tactic. Distortion also has its uses. For example, he caricatures Thomistic natural law thinking as a demand for hierarchical politics, repressing the people in the name of religion-based uniformity. He ignores the multiplicity of authorities that made the medieval era one of unprecedented development in the rule of law and human rights. His prejudice against religious thought leads him to mischaracterize the nature of politics in both the medieval and modern eras, for example by ascribing to earlier eras a demand for unanimity that flourished in early modern absolutism and especially in the thought of his lodestar, Jean-Jacques Rousseau. On this view, then, Robespierre’s mass murders are not a sign of totalitarian massacres to come in the murderous ideologies of the twentieth century, but rather throwbacks to an earlier era, showing merely the need for further democratic progress. This false narrative of diversity as a necessary corollary to democratization is deeply embedded in Kloppenberg’s book, and especially in his treatment of Rousseau. As to Rousseau, he minimizes that thinker’s responsibility for the deaths of his own children and for the mass murders of the Jacobins, while wildly overstating his influence on the American Founders. As misleading in its way is Kloppenberg’s simplistic treatment of Rousseau’s spirituality. Clearly no fan of Tocqueville, it is nonetheless odd that an intellectual historian would not at least engage with Tocqueville’s fear and loathing for pantheism, especially as it relates to Rousseau’s self-absorbed totalitarian individualism. Instead the reader is subjected to a rationalization of Rousseau’s destructive hubris and, in effect, a proffered program to use the state as the guarantor of atomistic self-actualization. Mentioned, but not examined, is the role of the state in “freeing” such individuals from various forms of wrong thinking in order to make them into the type of individual supposedly capable of the life of self-creation. Essentially unmentioned, of course, is Friedrich Nietzsche, whose destructive attacks have done so much to spawn the intellectual hatreds corroding the remnants of Christian civilization to this day. There are other glaring problems as well. Most obvious, and therefore properly most embarrassing, he mis-identifies Henry Clay’s home state as Tennessee rather than Kentucky. In a more systemic manner, Kloppenberg conflates traditional English practices of taxing aristocratic items with progressive welfare policies. And he takes very slim, often mischaracterized evidence to insist that there was early on a demand for some kind of national welfare and administrative state in the United States. The actual demands, much debated, were for rather narrow institutional developments that took on systemic importance only with later demographic, legal, and institutional developments. The rather haphazard nature of Kloppenberg’s narrative does not indicate a lack of systemic, ideological thought behind this work. In his introduction he argues that democracy is an “ethical ideal.” And the ideal seems serious, though rather trite and highly problematic in its formulation: “Modern democracy is rooted in the shared assumption that all citizens should have the capacity to shape their own lives within boundaries established by the standards and traditions of their communities, and that all citizens should be able to participate equally in shaping those standards and revising those traditions.” Kloppenberg’s summaries of political events and theories seem designed to show how citizens can be made “able to participate equally” in reshaping communal standards. His answer, of course, is through political action. Still, there are principles to be served, namely popular sovereignty, autonomy, and equality, along with the “underlying premises” of deliberation, pluralism and reciprocity. Kloppenberg attempts to trace these principles into deep history, but his trail is twisted and filled with blind alleys. This is not surprising, since their real origins lay in the same liberal prejudice that John Rawls and other social democratic philosophers have admitted (generally only while under intense scrutiny) serve as the basis for their own schemes. Neither is it surprising that, despite his claims to an egalitarian mindset, this proud Harvard professor who repeatedly references his employer’s importance seeks to maintain the oversight function of people like himself. There must, he argues, be an “outside” institution “to counter popular passions when they spin out of control.” This old justification for judicial supremacy, though clearly inapplicable to revolutionary changes instituted by that now very political institution, serve the same tired role as justification for continued rule by self-appointed elites. Important work has been done on the changing nature and justifications for democratic polities. In addition to Tocqueville, one could mention, here, Brian Tierney, Bertrand de Juvenal, and several others. Kloppenberg’s book is important, in its way. But not for its tendentious arguments and conclusions. It is important as a warning sign of what is yet to come from our elite institutions as the ideology of identity politics continues to fester and spread in the academy and society more generally. As more and more Americans are read out of polite society, their free speech attacked as a series of microaggressions outside the “overlapping consensus” drawn up and enforced by academics and various Social Justice Warriors, the notion that “reciprocity” and other “democratic” values require respect for the prerogatives of self-appointed elites should surprise no one. That they are willing to rewrite history as a means of erasing the grounds for reasoned dissent is equally obvious and should be equally troubling. Bruce P. Frohnen is a Senior Fellow at the Russell Kirk Center for Cultural Renewal and Professor of Law at Ohio Northern University College of Law.